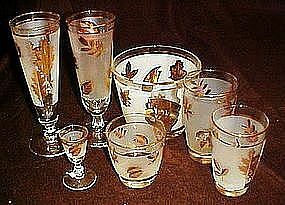 Libby's gold leaf or golden foliage tumblers are in very nice condition with no chips or cracks, Thick bottoms, frosted centers with assorted gold leaf details. and gold edge trim. I have 7 available Most are excellent and bright. A couple have wear to the gold ring between the edge and frosted area. Price is for each. I will be listing lots of other golden foliage pieces too.